The next 48% crash is coming. Don’t just watch your money disappear: using the proven power of trend investing you could avoid the big drops in the market andbeat the FTSE by a mile. In the last 15 years there have been two market crashes of 48% or more. If you’re just buying and holding, you could see your investments almost halve in value next time round. Since it was launched five years ago, our easy-to-use system has avoided every downturn and out-performed the FTSE by 31%. I’ll never forget that dreadful day. It was September 2008 and I was sitting in the pub with some colleagues after work. I was gloomy. The night before, the news of Lehman Brothers’ bankruptcy had been announced, and the market had dropped like a stone. “Well, that’s my investments heading down the tubes”, I said. None of my colleagues could offer any consolation. They were equally worried. The market was already down 22% in a year. And just a few weeks later, following the Lehman Brothers collapse, my portfolio ended up being worth 30% less than it had been a year before. In other words, my investments had lost a third of their value in just over 12 months. This was a huge shock to me. It was also a wake-up call. It completely changed my perspective on investing. Having lost a third of my wealth in a year, the approach I was using – an approach recommended by most experts, and followed by many investors – now seemed nuts. Did I really have to lose such a huge amount of money now, to make money later? And if this was about “investing over the long term”, how long was it actually going to take to end up on top? Could YOU cope with your investments losing a third of their value over the next few years? What would that mean for your plans for the future, and your retirement? And how many years or decades can you hold out for “long term” gains? You may have had a similar experience of the markets – sitting and watching anxiously as your hard-earned wealth evaporates. Or you may be fearful of the next huge crash that could decimate your savings. I’m here to tell you: it really doesn’t have to be this way. Avoid the big drops in the market… and stop worrying about the next big crash. Make money from rising trends, wherever they are happening. Beat the FTSE 100 by a mile – comfortably making market-beating returns. Take on only as much risk as you feel happy with. And all with a straightforward system that any average investor can use. These are bold claims, I know. But give me just ten minutes of your time, and I’ll explain my reasons for being so confident… give you the proof that it works… and tell you the secret behind the Saltydog system of trend investing. Then you can come to your own conclusions. But let’s start with you, and the situation that you probably find yourself in. Just like I was back in September 2008, most investors are absolutely helpless in the face of the ups and downs of the market. They trust that they’ll come out on top over the long term. But essentially, every time there’s a downturn they’re resigned to losing money. This is the ‘passive’ approach to investing, where you don’t try to react to market movements at all. Instead you “buy and hold” – buying stocks or funds and holding on to them for years, sometimes decades, irrespective of what the market does. Why do most investors do this? For one simple reason: they don’t believe it’s possible to get in and out of the market at the right time. That’s “timing the market”, and only super-sophisticated investors or whizz-kid traders are supposed to attempt that. After all, how can you possibly predict what the market is going to do next? Well, the fact is you don’t need to make predictions to successfully move in and out of market trends. And I’ll explain why in a minute. But let’s just consider what it means if you stay in the market, and don’t manage to avoid the big crashes. Let’s face it – huge market crashes are not an unusual occurrence. So if you’re in the market all the time, your wealth is on a roller-coaster ride. In the last 15 years there have been two market crashes of 48% or more: the dotcom bust of 2000-03, and the financial crisis of 2007-09. Both times your stock market investments would have been cut in half. Not only that, but even if you’d patiently endured these two market crashes and stuck it out to the other side, you could well have achieved precisely… nothing. Right now, here in 2016, the FTSE 100 is at the same level that it was in December 1999! In other words, with all the dramatic ups and downs of the last seventeen years, the sum total of the FTSE’s upward movement is… zero. Is that what you want with your investments? In terms of capital gains, that’s seventeen years of going nowhere. Nearly two decades. How long are you be prepared to be a ‘passive’ investor, hanging on in the market to see any positive return on your money? Thirty years? Forty? If your investments track the FTSE 100, it’s clear that any period under twenty years is pretty much a lottery. There’s also the huge risk of horrible losses, especially since you never know when the big downturns could occur. Do you want to see a 48% drop in your invested wealth one or two years before you’re about to retire – when you need to start using the money? Now you’re probably thinking… Of course I don’t want to suffer any losses if I don’t have to, but – apart from holding all my money in cash – is there really a way to do this? As you can see from the chart, something very interesting is going on. Look at where the arrows point to all the significant dips in the FTSE… and see what happens to the Saltydog portfolio (orange line) at those same points. The Saltydog portfolio doesn’t dip down nearly as much. In fact in some cases it stays flat, or even continues on an upward trend. This is particularly apparent with the big dip in the FTSE over the last year – see the chart below. Whilst the FTSE 100 fell by -14% from April 2015 to March 2016, the Saltydog portfolio actually went up by 2%. That’s an out-performance of +16%. Just as important, on every occasion when the FTSE 100 goes up for a few months, the Saltydog portfolio also goes up. Admittedly our portfolio doesn’t catch every quick upturn in the FTSE. For example, during 2011-12 when there’s a sharp upturn in the FTSE, the rise in the Saltydog portfolio isn’t nearly steep. But overall, one thing is perfectly clear. The Saltydog portfolio avoids the very worst of the market dips, and still takes advantage of the upturns. And the net result is very impressive. Whilst the FTSE 100 goes up 19% over this five-year period, the Saltydog portfolio is up 50%. That’s an out-performance of 31%! Is your portfolio up by a comparable amount to this, over the past five years? If so, congratulations… and you probably don’t need to listen to me any more. You’re clearly doing something very successful. But if your investment returns don’t look much like this, then do stick with me… because I’m about to explain how this kind of performance is perfectly achievable by you. “Beautifully simple to follow. About 9% increase over the last 12 months.” J.D. “Since October 2010 I have made an annualised 9.69%… I base decisions on the data used in Saltydog, which is very good.” M.I. “I like the fact that the work is done for me re. trend analysis of performance. Returns in three full years: 16% (2013), 7.5% (2014) and 10.5% (2015).” P.W. “I like the concise structure of how funds performance is measured and displayed. Performance 2015: 16%.” R.F. ✓ All the secrets behind Saltydog’s FTSE-beating performance, and how you can match it yourself. So, how does the Saltydog system work? What’s it all about? As I’ve already mentioned, Saltydog is a system of trend investing. (Also known as trend following, or momentum investing). In essence, it means that you identify upward trends in the market as they start to emerge, and put your money into them. And when a trend changes direction and starts to head downwards, you take your money out and put it in a new trend elsewhere. With Saltydog we do this by focussing on different sectors of the market. At any one time, some sectors are heading upwards, whilst others are flat or heading downwards. For example, during 2015 property steadily moved up, whilst stocks headed down. At other times, small company shares have performed incredibly well, whilst large companies have been pretty flat. Or emerging markets have gone on a tear, leaving developed markets well behind. Shares, bonds, property, emerging markets, technology, high-yielding companies and so on… the situation is always changing. With the Saltydog system we move our money between these different sectors, as new trends emerge. And this is extremely easy to do by using the relevant funds. Whichever sector you’re interested in (and we want the ones clearly heading up), there is a huge variety of possible funds to invest in. You can think of trend investing like putting your money on a horse race – except with one enormous advantage… as the race progresses, you are always able to switch your money to the leading horse, so that you’re in the best possible position throughout. In other words, your money is always making the best return that the current conditions allow – riding the upward movements in the market, and avoiding the downturns, exactly as you’ve seen in the chart of the Saltydog portfolio over the past five years. Obviously enough, this is an active system of investing. It means you need to be monitoring the market regularly – though no more than once a week – using the special data that we provide. And you need to be moving your money in and out of different sectors, to take advantage of the uptrends and avoid the downtrends. (In case you’re wondering, it’s not at all difficult if you follow our simple rules. I’ll explain more about how it works shortly). Now, as you may be aware, what I’ve just described is not the mainstream view of how you should be investing. In fact the Saltydog system goes completely against what most investment advisors, professionals, fund managers, gurus and journalists tell you to do. These experts all say that private investors should not attempt to get in and out of the market. In their eyes, for an average investor to try and take advantage of market trends is foolhardy, costly, dangerous or impossible. They think that anyone who tries to do it is probably deluded and will waste a lot of time and lose money. … if all these investment professionals say that “timing the market” is impossible for a private investor like me, then how can the Saltydog method work so well? How come the Saltydog portfolio has beaten the FTSE 100 by 31% over the past five years? What are all these experts missing? Or is there something funny going on? So let’s go through the main reasons that the experts give for why youshouldn’t try to take advantage of market trends… I’ll tell you what we think… you can hear from current Saltydog users … and then you can decide for yourself. The first objection to active investing is that private investors are demonstrably bad at it. Most investors, left to their own devices, time the market completely wrong. They get frightened by market crashes and sell out on the way down. And then they wait until a bull market has really got going, and buy late on the way up. So they buy high and sell low – the exact opposite of how to make money. In fact a study conducted in the US found that, over the last 30 years, the average investor in funds made an annual return of just under 4%. That’s while the US market (the S&P 500) made an annual return of 11%. In other words, private investors under-performed the market by 7% every year, for three decades! This is a pretty shocking statistic, and would no doubt be replicated here in the UK. The primary emotions of fear and greed are true of investors anywhere, leading the vast majority of them to make extremely unprofitable decisions. So one obvious moral to draw from this is: Don’t try to be clever about timing the market – you’re just not up to it. Don’t even bother. And that’s exactly what most investment advisors say. There’s even a saying that encapsulates this view: “It’s not about timing the market, it’s about time in the market”. In other words, you’re far better off buying and holding. Yes, most investors aren’t good at timing the market. We don’t disagree with that. But most investors don’t have a clear method or strategy that they apply. They’re simply at the mercy of the latest market news – getting frightened when the market drops, and getting over-optimistic when it heads up. In other words, they’re making very important decisions based only on vague ideas,feelings or guesses – which can easily change from one day to the next. The key point here is that the Saltydog system is not based upon a vague, subjective view of what the market, a fund or a stock might be about to do. It’s a system. It’s based on hard numbers. And there are clear rules to follow. So with Saltydog you’re not acting on your own hopes, fears or hunches of where the market might be heading. On the contrary, you look at some very specific numbers and information which we update for you every week – numbers that clearly show you trends that are already happening in the market – and you make your decisions from that. It’s not going by your own feelings. And it doesn’t rely on you making predictions or guessing where the market might be heading next. Instead it’s looking at the weekly Saltydog data and following a few simple rules. As long as you’re capable of comparing a few numbers (“This is the highest… These are the most consistent”) and following some basic guidelines, it’s perfectly possible for you to take advantage of market trends using the Saltydog system. And you can do it in exactly the same way that we have done to achieve our31% out-performance of the FTSE 100 over the past five years. I’m totally confident that the Saltydog system works for ordinary investors? I strongly believe that any reasonably intelligent and motivated investor can achieve this kind of performance using Saltydog… and that includes you. The next objection to active investing is that it’s extremely costly. Well, the answer to this is simple: No, it isn’t. OK, it’s a bit more expensive that doing little or nothing with your portfolio. But the charges probably aren’t what you imagine at all. Let’s say you have a portfolio of £100,000. With the biggest broker in the country, Hargreaves Lansdown, it will cost you precisely £450 a year to buy and sell as many funds as you like, as often as you like. With Hargreaves you pay a 0.45% management charge per year (that’s your £450) and then there is no charge at all for buying and selling funds. You can buy and sell as often as you please, without incurring a single additional penny in costs. With another broker, Charles Stanley, it’s even cheaper. With a £100,000 portfolio it would cost you only £250. That’s a management charge of 0.25% – and again, no charge at all for buying or selling funds. Yes, with Hargreaves Lansdown you are paying nearly half a percent of your portfolio value every year in fees. (Though with portfolios over £250,000 the percentage fee is lower than 0.45%). But what about your potential returns, using the Saltydog system? As I’ve already pointed out, the FTSE 100 has gone up by a grand total of 19% over the past five years. If your portfolio has made similar gains, that’s not really much to shout about, is it? On the other hand, if you had made just over 8% net return per year – which the Saltydog portfolio has achieved, which many Saltydog members have achieved, and which I believe YOU can achieve – that would amount to a cumulative return of 50% over the same five-year period. Yes, you’ve paid some costs. But have your gains been eaten up by your trading fees? Not anywhere close! If your investments aren’t doing as well as this, then the broker’s charges you pay to run the Saltydog system would easily be outweighed by an improvement in performance. The costs are really pretty insignificant compared with how the Saltydog system could boost your returns. The final objection is that trend investing is just too difficult and time-consuming for the average investor to pursue successfully. My short answer to this is… codswallop! But I’ll give you the longer answer too. Since the Saltydog system is all about actively managing your investments, of course it requires some work and takes up some time compared with passive investing, where you do practically nothing. So if you don’t want to give up any time at all, or you prefer to have one meeting a year with your financial advisor, for example, then the Saltydog system is definitely not for you. But is it too difficult or time-consuming? No. At least, not for any investor who wants to properly take control of their their money and seriously out-perform the FTSE – which, as I’ve said, is a perfectly realistic possibility. I’ll give you the practical details in a minute. But rest assured, you don’t need any technical skills or complicated financial knowledge. You just need to be able to compare some numbers and look at a few simple charts. It’s really not difficult. Again, you don’t have to believe me. “Simple, easy to use system. Very pleased.” S.L. “Very simple to follow, has given me an 8% return annually. Allows me to draw a better income from my pension than otherwise.” M.K. “Easy to follow, consistently performs. Made about 7-8% in the last year.” N.M.
“The system is easy to use and update. I have used it successfully over the past two years making 15% and 7%.” S.H. As I say, these people are not experts or financial professionals – they areprivate investors just like you. They find the Saltydog system simple and easy to follow. They are significantly beating the market. And they are making consistent, positive returns, even in years when the FTSE 100 has fallen or is flat. And there’s absolutely no reason why you couldn’t have an equally positive experience, with an equally profitable effect on your investments. In a moment I’ll explain how you can do this. But first, a brief introduction. As I mentioned earlier, the Saltydog system is based upon investing in funds, not purchasing individual company shares. The reason for this is very simple: when Douglas started investing it was using funds, and he developed the system from there. *They provide exposure to all markets and all sectors across the globe – allowing us totake advantage of uptrends wherever they occur. *Theyspread your risk across a range of different companies within one sector, meaning that your portfolio isn’t dramatically affected if one particular company gets into trouble. *You getsmart people with research teams doing stock picking for you, meaning that you don’t have to be an expert in individual companies. Now some investors only want to pick individual company shares. That’s fine, but it’s not what the Saltydog system is about. Other investors object to the large salaries that fund managers get paid, or are concerned about the costs of buying and selling funds. To be honest, neither of those objections really concern us. Of course we want to keep our costs down. As I said earlier, you can buy and sell as many funds as you like by paying your broker a reasonable annual management charge. But ultimately we’re looking at the overall return our investments are making. As you’ve seen from the Saltydog portfolio and from the gains achieved by Saltydog users, we’re substantially and consistently out-performing the market. The Saltydog system has beaten the FTSE by 31% over the past five years. And that’s the main thing we care about. So how can you achieve this too? There are two ways you can apply the Saltydog system yourself. The easiest way is simply to copy one of our two demonstration portfolios, which we update every week. You can choose between a very low risk portfolio (the “Tugboat”), and another more adventurous one (the “Ocean Liner”). If you do that, it will probably take you 15 minutes each week – enough time to read the weekly email update from me, and then to make the changes to your funds by phoning your broker or going online. (And there are many weeks where we make no changes at all). With this option you don’t have to do any analysis if you don’t want to – you simply copy the changes I make to the demonstration portfolios. The other way of using the system – which is what we designed it for – is to interpret the Saltydog data yourself, using the rules and principles that are fully explained in our members’ handbook. If you use the Saltydog system actively like this, it will probably take you thirty minutes to one hour per week. Obviously the more you use the system and become familiar with it, the quicker it takes. And, as I’ve already explained – and as Saltydog users have said themselves – it’s really not hard. The Saltydog rules and guidelines are straightforward to understand – and fully explained in the in-depth introductory guide you receive when you sign up. And we present the weekly data in an extremely accessible way, using clear, simple colour-coded tables and charts, making it easy to come to conclusions about what you should do. Plus, I give you my thoughts, advice and guidance every week via two email updates. In addition, I also send you a monthly newsletter through the post, giving you further guidance and advice. ❖Every Wednesday we release the latest update of the Saltydog data on our website. The tables and charts show all the best-performing sectors of the market, and the best-performing funds within those sectors. ❖On Wednesday morning – usually between 11.00 – 11.30am – I send you an email giving you my overview of the market situation and how things have changed over the past week. At that point, you can log on to the Saltydog website and review all the new data and charts yourself. ❖On Wednesday evening – between 6.00 – 7.30pm – I send you a further email which describes any changes (buys or sells) we are making to our demonstration portfolios, along with an in-depth explanation of the reasons why. If you wish, you can simply follow the changes that we make, and – if you have an online broker account – you can place your buy and sell orders right away, ready to be executed the following day. On top of this, if you have any questions whatsoever about the system or how you should use it, I’m always here to help. Just send me an email, and I’ll do my utmost to reply as quickly as possible. Sign up now, and you can try out the Saltydog trend investing system for FREE for the next two months. See all the details of the funds in our market-beating portfolio, track our performance week by week, and start to implement our trend investing system yourself… for free. Rest assured, we won’t take any money until the end of the 2-month trial period. And you can cancel at any time you like. There’s no catch and no small print. (To cancel just email me, Richard Webb, at info@saltydoginvestor.com). The comprehensive Saltydog Members’ Guide: “How To Beat The Market Using Trend Investing”, giving you all the principles and rules of successful trend investing, using our system. Our “Getting Started” guide, explaining practical details about brokers, platforms, fund supermarkets, types of funds, and the costs involved. All the unique Saltydog sector and fund data, updated weekly – enabling you to pick out the winning and losing trends in the market at any time, along with the very best sectors and funds to take advantage of them. The details of our two demonstration portfolios – the ‘Tugboat’ and the ‘Ocean Liner’ – including our current recommended funds, so that it’s simple for you to copy what we do and to replicate our performance. Back issues of our monthly newsletter, showing the monthly trends in the market and packed with additional trend investing advice and guidance. Two weekly emails from me, every Wednesday morning and evening. 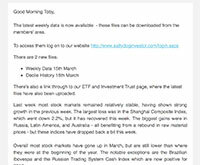 My morning email gives you an overview of the latest weekly data and my view of the market trends. In the evening email I explain the changes I’m making to the two demonstration portfolios – which you can then copy as you wish. Our monthly Saltydog print newsletter, showing the monthly trends in the market, plus analysis of financial news, additional trend investing advice and general guidance on improving your investment performance. Access to me to answer any of your questions. Just email me with any queries and I’ll get back to you as soon as I can. This is everything you need to get going as a successful trend investor using the Saltydog system. There’s absolutely no obligation for you to continue after the 2-month free trial. You can cancel at any time during the first two months, and it won’t cost you a penny. ‘I have long given up trying to understand the stock markets from a fundamentals point of view. There’s no obvious correlation and I see it more of a herd mentality. So therefore I like the Salty system… My annualised return since I started is 8.5% .’ R.L. ‘Value investing, which I had been trying to apply, is not for one in his late 70s. You have to stomachlong periods when key holdings are deeply under water. Back the horse that IS running fast, not one that just might run fast… In 2015 I made 8.8%.’ D.E. ‘I like being able to quickly react to changes in the market. My other investments which are supposed to be actively managed by an IFA hardly seem to change from one year to the next and I keep being told ‘it’s for the long term’, which seems lazy to me.’ O.K.